Helping to Change the World—One Person at a Time! A word from God’s Word:“It is God himself, in his mercy, who has given us this wonderful work [of telling his Good News to others], and so we never give up” (2 Corinthians 4:1, TLB). The Impact of Electronic Communications! of the year using some of today's most powerful means of communication—the Internet and e-Mail. As a result, there is rarely a day when ACTS doesn't receive decision responses for Christ from somewhere in the world. The countries from which we have received decisions are listed at: http://www.actsweb.org/response_countries.php—from Accra to the United Arab Emirates, and Zimbabwe—and 163 other countries in between, including Iceland! 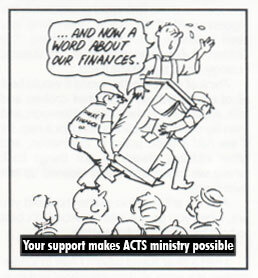 ACTS main website is http://www.actsweb.org. The accompanying follow-up website is http://www.actsweb.org/living which lists "Ten Steps" for Spiritual Growth. Every decision respondent receivses the link to this website and is encouraged to read every article, one of which is titled, "What a Good Church Can Do for You." We also have gospel websites in Spanish, French and Finnish. These websites also have accompanying Follow-Up websites in the matching languages. A listing of these are at: http://www.actsweb.org/action.php. According to reports from Google Statistics, on average every month visitors to ACTS websites come from 194 countries and territories. Think of the economy of this as we only have two staff in our US officeâ€”Joy, my wife, and myself. We keep very busy! Besides the many visitors to ACTS websites, every weekday of the year 210,000+ worldwide subscribers receive ACTS daily devotional, Daily Encounter, which has become ACTS most effective gospel outreach tool. One one occasion—in one day—we received 41 decisions for Christ in response to the Daily Encounter titled: "How to Be Sure You Are Going to Heaven." In addition to the English edition of Daily Encounter there are 11,300+ subscribers receiving the Spanish edition, Encuentros Diarios. "Thank you for the great lesson about forgiveness and taking ownership of our own actions. May God continue to bless your ministry." – Sincerely, R.B. Tragically, according to the highly respected Barna Research Group todayâ€™s church in the USA is in decline. In past years God has greatly blessed the Church in the USA, where we have more churches per 100,000 population than any other country in the world—and more churches per 100,000 population than in some entire countries. And yet, with all our education, multiple staffs, advanced technology, multi-million-dollar church premises, and our incredible resources, why are we making less and less impact on our society, and why are we in decline? I couldn't even get our former pastor to include a gospel message on the church website. While we are the richest church on earth, according to statistics I have read, the average church in the U.S. spends 95% of its income ministering to its members—ourselves! True, churches are vital for worshipping God collectively, for fellowship and to strengthen every believer for service to God, and we do this by serving people and being a witness to take the gospel to the nations. Jesusâ€™s commision to every church and every Christian was and still is: "You are to go into all the world and preach the Good News [the Gospel] to everyone, everywhere" (Mark 16:15 TLB). As the late Oswald J. Smith, missionary statesman from Canada, said, "The supreme task of the church is the evangelization of the world." And as another has wisely said, "Our greatest legacy will be those who live eternally in heaven because of our efforts." And as Winston Churchill stated, "We make a living by what we get. We make a life by what we give." We praise God that via the web and e-Mail ACTS is reaching people to the far corners of the world with the saving gospel of the Lord Jesus Christ. This is not only a phenomenal opportunity, but also an investment in eternity. We are extremely thankful for every ACTS prayer and support partner. Everyone plays a vital role in helping make ACTS gospel outreach possible. Again this month, we are totally dependent on both your prayer and financial support to keep us actively reaching people worldwide for Christ every day of the year. As you stand with us with your vital support, may God richly bless and reward you in His own abundant way. P.S. "Our greatest legacy will be those who live eternally in heaven because of our efforts." Support can be donated online via ACTS secure donor site: https://actscom.com/donate.php, or by mailing/posting a check to ACTS International address below. NOTE: ACTS International is a 501(c) (3) nonprofit organization. U.S. donations are thus tax-deductible. We truly thank God for the wonderful means of communication He has given to His people of today; for the wonderful privilege of being able to reach so many people for Christ every day of the year; and for all of God's provision through His people to make ACTS gospel ministry possible. Please continue to pray for God's protection from all attacks, and for His provision so ACTS can continue to reach as many people worldwide as possible with the saving gospel of the Lord Jesus Christ. P.S. Please consider using the ACTS Business Witness Cards—a very simple, tactful and effective way to witness for Christ. For Witness Cards ... see below! Donations can be sent on the ACTS secure donor site at: https://actscom.com/donate.php. Donations can also be sent via the mail/post to ACTS International at the address below. Donations can also be sent via direct bank transfer to the bank account of ACTS International. For information on how to do this, please check HERE and then check the box that says: Please send information regarding sending donations by Direct Bank Transfer. REMINDER: ACTS International is a registered 501(c) (3) nonprofit organization. U.S. donations are tax-deductible. Continued need for special prayer. As noted before, this past year we lost one half of our regular monthly supporters; thus there is a vital need to replace these donors so we can maintain our uncompromising gospel outreach. Ralph Porter, a military chaplain, forwards many issues of Daily Encounter to those to whom he ministers. In doing so he is reaching many service personnel with the gospel of Jesus Christ. So we encourage you to also forward copies of Daily Encounter to friends and contacts to help share the message of Jesus Christ with them. For helps to share Christ with family/friends go to: www.actsweb.org/light.php. For "Business witness cards" go to: https://actscom.com/witness_cards.php. For copies of ACTS Passport for Heaven booklets: http://tinyurl.com/passport-heaven. Business witness cards are available to invite friends and contacts to visit a Good News website where the gospel and Christian message is applied to the every day needs of readers and communicated in non-churchy language. Click HERE for more information, to see the back of each card, and to order. Witness cards offer a simple, attractive and non-threatening way to help spread the gospel around the world via the Internet. These cards come in packs of 50 and are available on line for a small cost to cover the cost of printing and shipping. NOTE: Good News Business Witness cards are available in packs of 50 for: "Thank You for your friendly service," "Find Peace With God," "Daily Encounter" "USA." "Canada," "The World," "How to Be Sure You're a Real Christian," "Thank You US Marines and Families," "People Power Invitation," "Good News for San Clemente" and in "Spanish" for a donation as small as $5 or more. See samples at: http://actscom.com/witness_cards.php. Click HERE to be on the ACTS Snail Mail List to receive this monthly report via snail-mail. To DONATE online on our secure server to ACTS U.S.A. NOTE: U.S.A. Residents: ACTS International is registered in the State of California as a non-profit 501 (c) (3) tax deductible organization. and How You Can Invest-Help.